The 2016 Beaujolais Nouveau Wine is Here! I first learned about Beaujolais Nouveau when I was living in Jacksonville, FL. I was hanging out in the office of the local alternative news weekly and one of the reporters mentioned how excited she was get her case of Beaujolais Nouveau. As a wine newbie, I had no idea what she was talking about so I started asking questions. She was excited to tell me the whole history of the wine and tradition. Beaujolais Nouveau symbolizes the end of the harvest season and represents an invitation to partake of autumn’s bounty. The French have always enjoyed Nouveau as a sentimental wine to drink this time of year among family and friends. What started as a competition among French wine distributors to deliver the first Beaujolais Nouveau to Paris has grown into a worldwide celebration. Released after the stroke of midnight on the third Thursday in November per French law, Beaujolais Nouveau is a bright, fresh red wine made from the Gamay grape. American wine lovers have come to mark its festive release as the unofficial harbinger of the holiday season. After our conversation, the reporter invited my and me to her house to try some. This was where I first tasted Georges Duboeuf Beaujolais Nouveau. I’ve been a fan ever since. No other wine is released annually with such pomp, made and released as a finished wine in only six to eight weeks after harvest to literally put a cork in the end of the growing season. The 2016 Georges Duboeuf Beaujolais Nouveau is 100% hand-harvested, using traditional vinification methods that include carbonic maceration. The label, which was chosen via social media, captures the spirit of the wine harvest with its fanciful presentation of its signature Gamay grape’s journey – first from vine to bottle, and then off to wine lovers around the world. 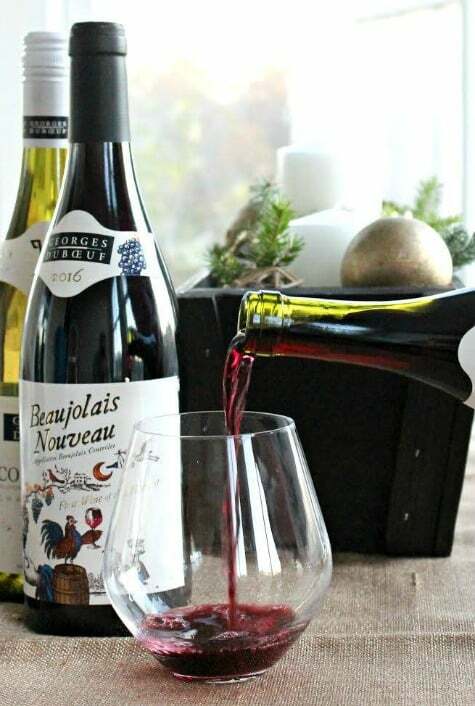 Retailing at $11.99 nationwide, the 2016 Georges Duboeuf Beaujolais Nouveau complements an abundance of holiday dishes, from savory roasts to cranberry sauce, with all its fresh aromas of red and black fruits, strawberry jam and hints of white peach on the nose. It is fresh, fruit-forward and flavorful on the palate with a deliciously satisfying finish. It is best served slightly chilled, between 62°F – 66°F, which is just slightly cooler than room temperature, to enhance the aromas and fruit flavors.